IMAGINE a British laat sahib out on a shikar in a jungle at the invitation of a maharaja being stationed safely on a machan (wood platform built on tree-tops), being guarded by armed soldiers below. While awaiting a tiger to be driven by drum beaters below, he would while away precious hours, relishing succulent kebabs and fowls stuffed with Persian dry fruits and sipping a burra or chhota peg. In the grand finale when the tiger appeared, the great gora sahib should aim, pull the trigger straight at it and make it swoon to the ground in a gush of blood. Then the ‘pale sahib in his high-domed topee’ would stamp his foot on prized catch’s head arranged on its paws — for a photograph that (years later), would brighten up faded memories of shikar in India. Over years of colonial rule, shikar grew into an institution, acquiring a cult of high status for the British assured of the natives servility. It meant an exclusive sport, a face-to-face encounter with the world’s exotic wildlife, an experience of romantic thrill in jungle, a taste of power and pride—all coupled together in reality—a tamasha of glorified, organised animal slaughter. Charles Allen opined, "... (shootings) were an essential part of rituals of state, necessary displays of power by princes, made largely impotent by Pax Britannica." The English combined political guile and escape from daftar’s drudgery with shooting and entertainment. "Come and stay with us in India and we will arrange for you to shoot tigers from the back of elephants from the back of tigers," Lord Curzon remarked to a friend giving a alternative to England’s boring fox hunting. Come September 16, every year, and the British would declare the commencement of the hunting season in India, not that they did not shoot in the other months. To please British Viceroys, generals, colonels and a hierarchy of high-ups, Indian royalty organised hunting even reserving forests for their pleasure e.g. Dhami was called "Viceroy’s Shooting Box," as the British loved its flora and fauna. Rule 14 of the-then Shikar Rule of Shimla Hill States and Shimla District clearly stated: "Shooting in Dhami State near Ghanna-ki-Hatti is prohibited. All forests here are preserved for the use of His Excellency, the Viceroy." Out of a forest land totalling 28 square miles, 2355 acres were reserved and its game carefully preserved as a shooting and entertainment ground for the Viceroy, paharis being totally denied from hunting in their own land. The Maharaja of Gwalior had a hunting lodge and a tiger preserve in Shivpuri, interestingly named George Castle after the British king. Shikar was no ordinary sport involving massive expenditure, deployment of human resources, organisational skill, all enveloped by pomp and pageantry, Indians kow-towing to gora sahibs and pandering to their whims and fancies. A visit from the laat sahib was always prestigious for royalty. The bandobast was pukka to the last detail. Natives pitched tambus tying machhardanis (mosquito nets) with gussalkhanas having ‘thunder boxes.’ Tents of some maharajas even had a brick floor with Persian rugs, fireplaces being done up like English country houses. Bearers donning starched white pagrees, hovered around guests serving pulaus stews, curries, sherbet, bacon and even ovaltine from mud kitchens. The entourage included khansamas, khidmatgurs, coollies, beaters, etc. Beaters and villagers beat tom-toms and played flutes to drive tigers to awaiting hunters. The Maharaja of Rewa had 5,000 beaters to drive 16 fully grown tigers for Lord Curzon’s hunt. Lady Dufferin wrote, "... a thousand beaters were employed and only 24 birds killed..." A century ago, a beater was paid Re 1 and 8 annas daily. To help them, the retinue included ‘a collection of canines’ usually named tipoo, whiskey, soda, poppy, lancer, Caesar, Douglas, Johnny and such English-named Indian dogs. Despite memsahibs’ general inability to stand the heat, there were lady shikaris too. Writes Ann Morrow, "As a courtesy... Vicereine or Commander-in-Chief’s wife Lady Chetwode — would be offered the first shot. They may have looked frail with their porcelain skins and appealing in their becoming jungle skirts made by the dhurzie, but they would lie for hours on their stomachs resilient and elated." 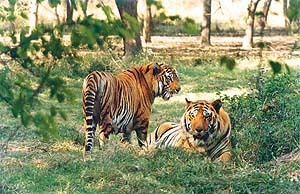 To pamper their egos, every tiger shot by the goras was declared as invariably ten-feet long. If the laat sahibs were not good shots, beaters gathered every bird shot and "put them in a flattering pile beside the imperial butts." Imagine a few staggering figures of ‘bags’ — animals killed for pleasure. Bengal civil servant George Yule bagged 500 tigers in 28 years, Maharaja of Surguja killed 1710, Duke of Windsor shot 17 tigers in one week in 1921, while two were shot later during the visit of Queen Elizabeth to Ranthambhor in 1961. The Cooch Behar Maharaja alone bagged 365 tigers, 311 leopards, 438 buffaloes and 207 rhinos. ‘Bizarre blood sports’ Included lesser shoots of antelopes, barking deer, bear, boar, jackals, hogs, etc. The English stalked for rhinos in the terai region bordering on Assam or Nepal and Karakoram’s rare Ovis Poli. The scrapbook of a district collector in 1900 mentions the accuracy required to shoot a mugger in an alligator hunt down the Ganges near Allahabad. "Skins were sent to leather tanneries at Cawnpore and returned as handbags and briefcases." Tiger, panther and crocodile skins were shipped ‘home’ by P&O steamers. Dead elephant’s feet held umbrellas while tusks were used for gongs. ‘Shot for the pot’ included quails, partridges, jungle fowls, wild ducks, sand grouse, etc. Sir Montague Butler, Governor of Central Provinces and Jashpur’s Maharaja, shot no less than 527 ducks. When Lord Reading went to Bharatpur to inspect flood destruction, he managed to bag 1700 ducks. But Lord Linlithgow’s record bag of 4,273 birds only puts them to shame. The Raj made much of shikar, which was nothing short of pageantry of organised animal slaughter, where man’s might triumphed over animals’ right to life, only underscoring the latter’s vulnerability. Zulam of the greatest kind, it heralded the extinction of some species — ironically, initiated by countries whose spokespersons sermonise about animal protection today.